The Toronto Rock had only one thing to do on Saturday night: win. A win against the Colorado Mammoth meant the Rock’s 2018 playoff hopes would still be alive, although they would also have had to count on a Sunday afternoon loss from the New England Black Wolves to secure their spot. Going into the Pepsi Center and stealing a win from the red hot Mammoth was always going to be a challenge, and the Rock just couldn’t beat it, falling short 19-15 in a wild west shootout. Though the Rock dropped five of their last four games, the effort they put forward against the Mammoth was noticeable. The Rock had issues giving up multiple goals early in games, but this was not the case on Saturday as they scored three consecutive goals to give them a 3-0 lead in the first. Scoring early and often is the key to success when playing a strong defensive team like the Mammoth. With star goaltender Dillon Ward having another incredible year, every run a team goes on needs to be impactful. Though Toronto got out to the early lead, the Mammoth did not let it get too large, scoring back-to-back goals from Jeremy Noble and Eli McLaughlin making it a one goal game. This one-goal-gap lasted over four minutes until Reid Reinholdt increased the Rock lead 5-3. The second quarter became the Rock’s kryptonite this season; that is, they fare poorly during those 15 minutes. But, the Rock put up a solid fight this time around. Tom Schreiber came knocking first to build Toronto’s lead to 6-3. Colorado was on their heels early in this game, but they found second gear later in the frame and went on a 6-2 run. This high offensive explosion from Colorado blew the door off the Rock’s lead as they went up 8-7. 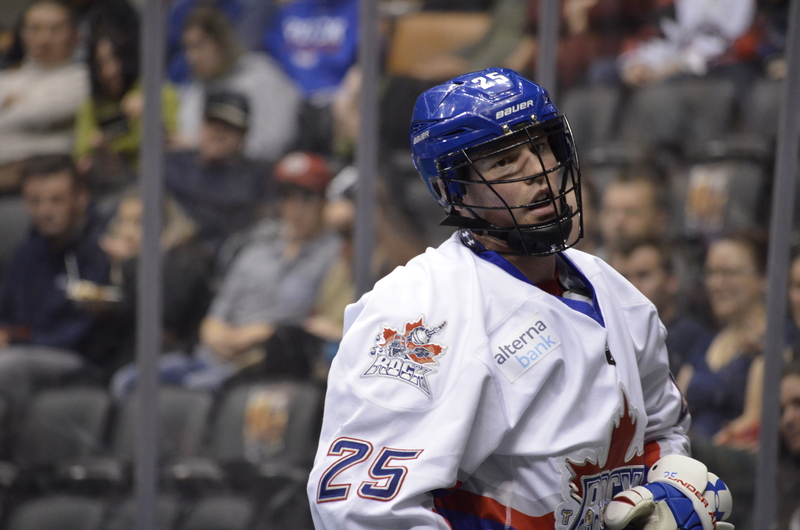 During the Mammoth’s outburst, Brandon Miller found himself thrust into the game. Miller had played fewer than 50 minutes the whole season behind starter Nick Rose. He finished the night with seven saves on nine shots in just 6:50 of relief work. Coming out of halftime, Toronto looked to reclaim the momentum as Challen Rogers opened the scoring 40 seconds into the frame. The tight game made it easy to see how this match felt like a playoff game. Colorado could have been complacent, though no competitive team ever really is. But for Toronto, this game meant everything. Zach Greer and Jacob Ruest scored back-to-back goals to regain the Mammoth lead at 10-8.Toronto then went on a four goal run, three of which were scored by Dan Lintner. With this game resembling more of a tennis match, the Mammoth scored three goals in a row to close out the side. The Rock would go into the final 15 down 13-12. Colorado took hold of the game in the fourth as the Rock ran into a hot Dillion Ward, who was tested with 18 shots while the Mammoth only registered eight. But with those eight, six went in as the defense faltered. Toronto did their best to counter but only was able to get three of their own. Colorado’s Joey Cupido completed a hat trick with two shorthanded goals in the quarter. Ryan Benesch also scored shorthanded. The Mammoth scored four shorties in the game. Schreiber paced the Rock offence with seven points (2G/5A) while Adam Jones (3G/3A) and Rob Hellyer (6A) each chipped in six points. Lintner scored four times and Reinholdt and Brett Hickey each had a pair of goals. Rogers and Damon Edwards each scored once. For most of the season, Toronto had no issues putting up goals. But the issue they have had has been limiting other teams. Early goal runs by opponents were this team’s Achilles’ heel. Had the Rock made the playoffs, especially against heavily fire powered teams such as the Mammoth, they would have needed a defense-minded face off strategy to limit those fast breaks. Face offs especially became an issue late in the season with Bradley Kri nursing an undisclosed injury that kept him out of the circle, though he was still able to run on D.
The Mammoth will host the Calgary Roughnecks on Saturday in a single-elimination division semi-final. The winner will face the Saskatchewan Rush for the west division title.